Four easy steps to a new way of traveling. Download our mobile application for Android/iOS, Sign up and immediately start requesting passenger or package deliveries to any destination within your city. Select the type of vehicle you want at your service and confirm your request. Our easy to use app will make the process smooth and enjoyable. Your request will be sent to one of our well-trained, friendly drivers and within minutes you will receive confirmation of a driver heading your way. Enjoy a secure traveling experience with a trusted driver and you will be at your destination sooner than you know. After all, time flies when you’re having fun. Built for your convenience, enjoy the luxury of paying for your Vaya trip using Ecocash™, Visa™ or MasterCard™. With seamlessly integrated solutions, paying does not get easier than this! Our service is built on great service delivery to you. Once you have paid for your trip, rate your driver and our service. Your feedback ensures that we continuously improve and solve your queries as fast as we offer our rides. 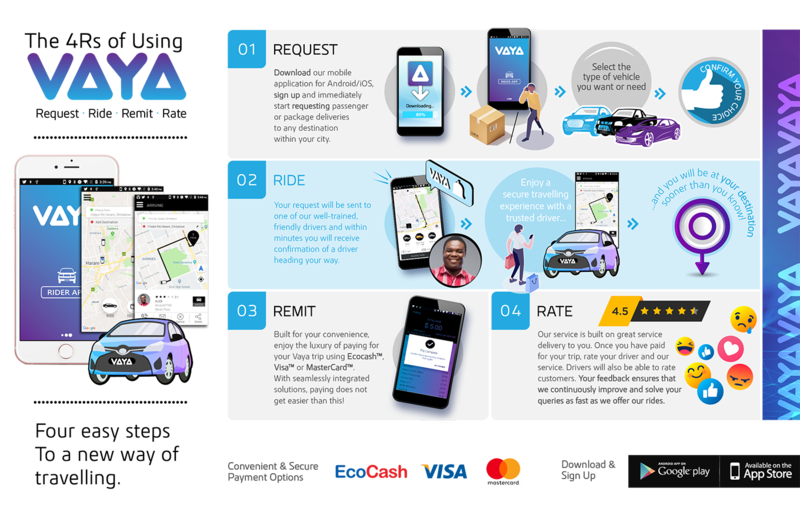 Drivers will also be able to rate customers for a customer-centric ecosystem of riders and partner-drivers that always leaves you with a smile.